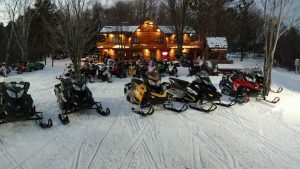 Looking for a spacious vacation getaway for a small group, multiple families, couples or a group of hunting or fishing buddies? 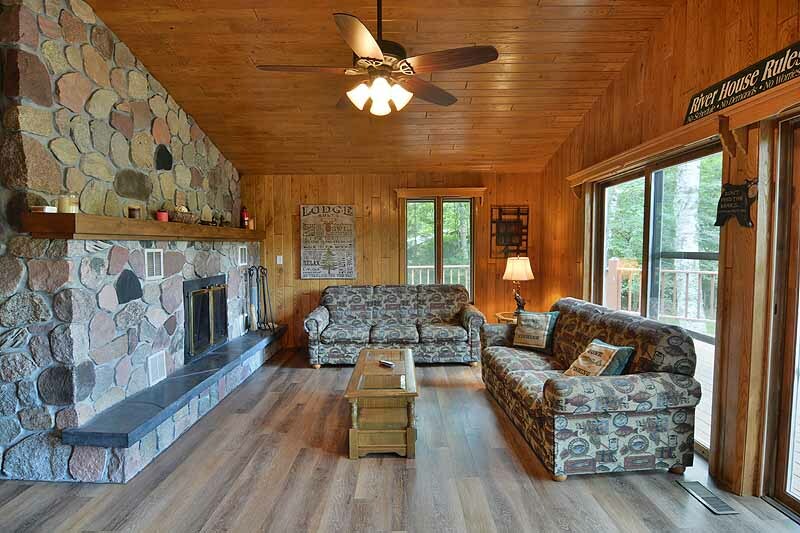 This 3500 square foot, split level vacation home rental offers two full floors of living space with 5 separate bedrooms, 2 full kitchens, 2 spacious living rooms and 2 full baths. 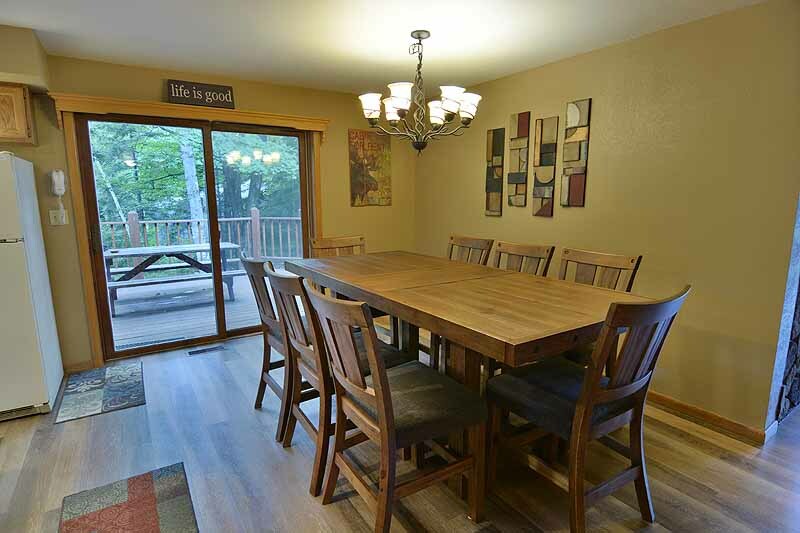 The Split Level House has plenty of space both inside and out to comfortably accommodate your small group! Our largest home featuring 2 living rooms, 2 woodburning fireplaces and 2 kitchens! Includes telephone, dishwasher and central air. 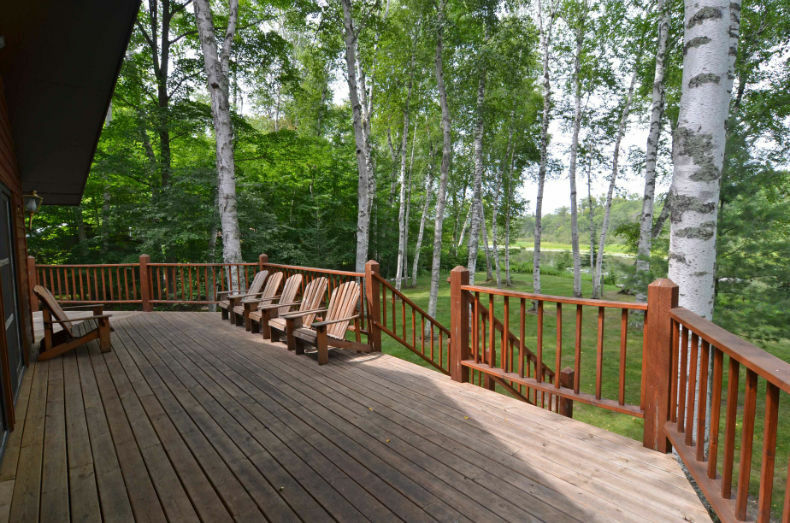 Large wrap around deck with a cedar exterior and set among a beautiful north woods setting of white birch trees. 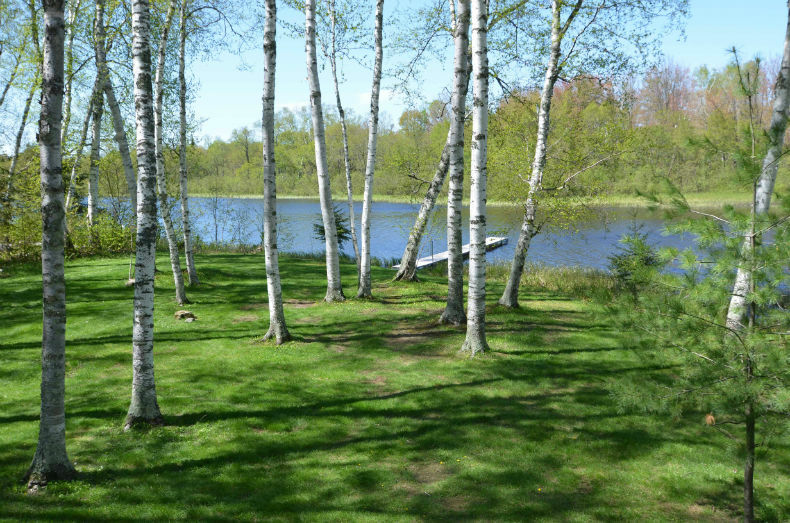 Set among beautiful white birches on the Namakagon River, the house has a cedar siding with stone veneer exterior and a 1500 square foot, wrap around cedar deck with a picnic table and BBQ charcoal grill. A large yard leads down to 170 feet of waterfront and a private boat dock with easy boat access to both the river and lake. There is plenty of space in the yard for outdoor activities and room to park multiple vehicles and trailers in the parking area. Upon entry, a set of stairs leads to each of the two complete levels of living spaces. 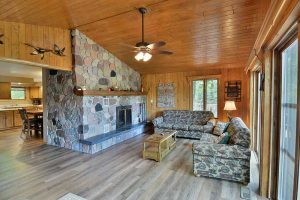 The spacious, open upper floor contains a full kitchen, large living room with massive stone, wood burning fireplace, 2 bedrooms and 1 full bath. 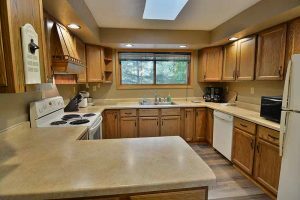 The bright kitchen has a 4 burner electric stove, oven, blender, coffeemaker, microwave, toaster and full size refrigerator/freezer. 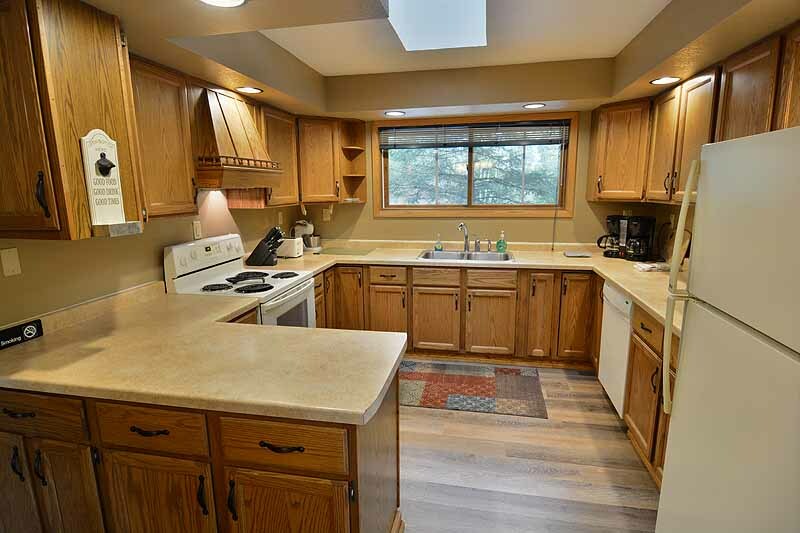 There are plenty of cabinets to store your provisions and ample counter space to prepare meals. 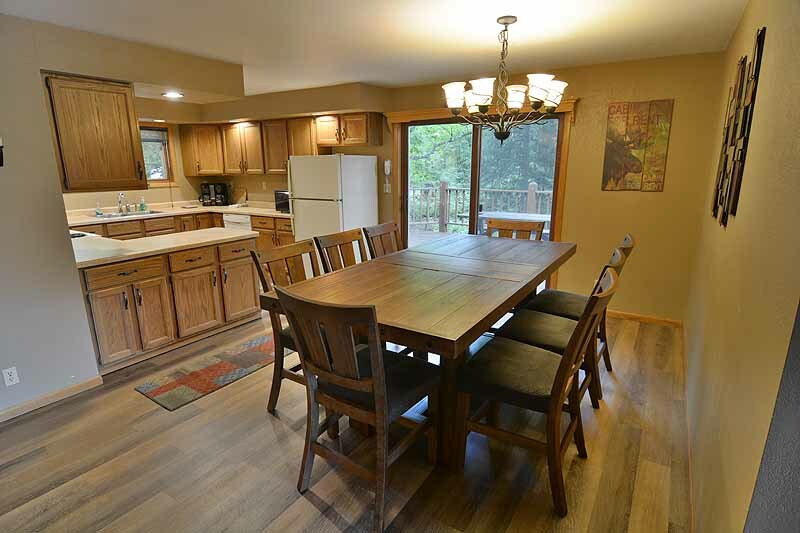 The tiled kitchen and dining areas open both to the large living room and to the cedar deck. 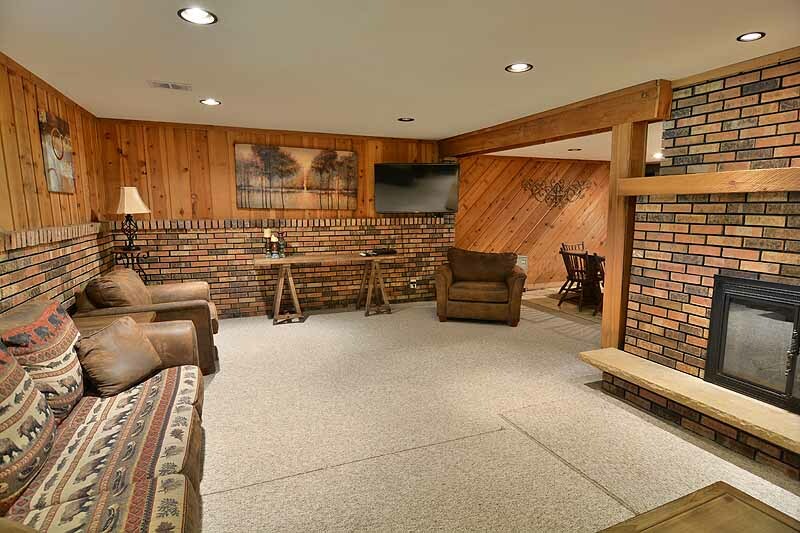 The wood tiled living room contains a massive wood burning, stone fireplace and plenty of seating with 2 comfortable couches and 2 chairs. There is also a flat screen TV with Cable TV and a DVD player. 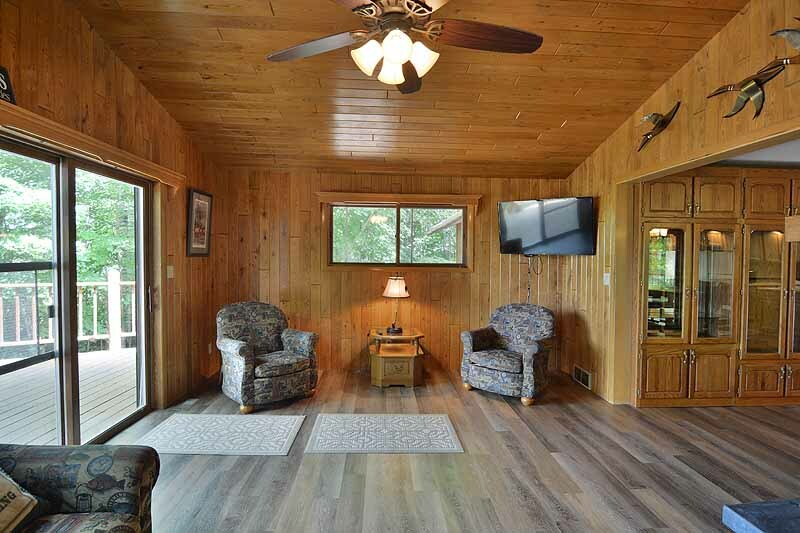 The living room with its sliding doors to the deck enjoys a beautiful view of the yard and water front. The upper floor has 2 carpeted bedrooms and 1 full bath. 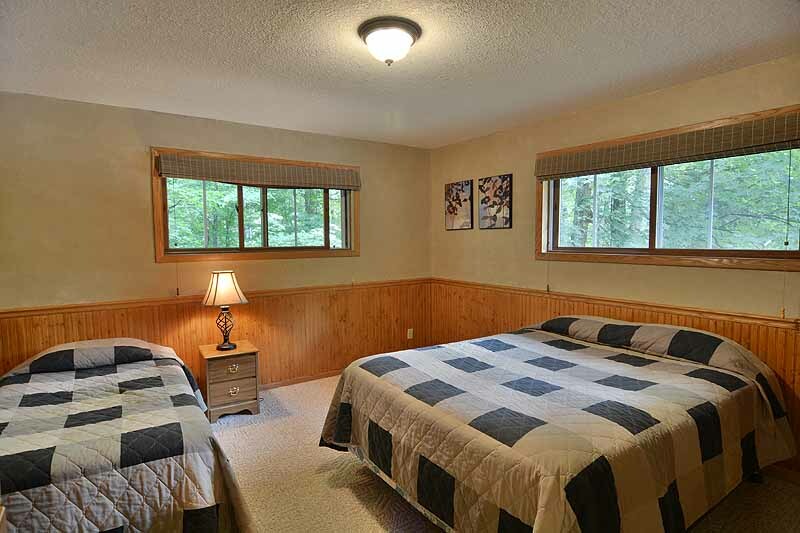 The first bedroom has 1 king bed, 2 twin beds, large closet and walkout access to the deck. The second bedroom has 1 double bed and 1 twin bed with a closet and dresser. 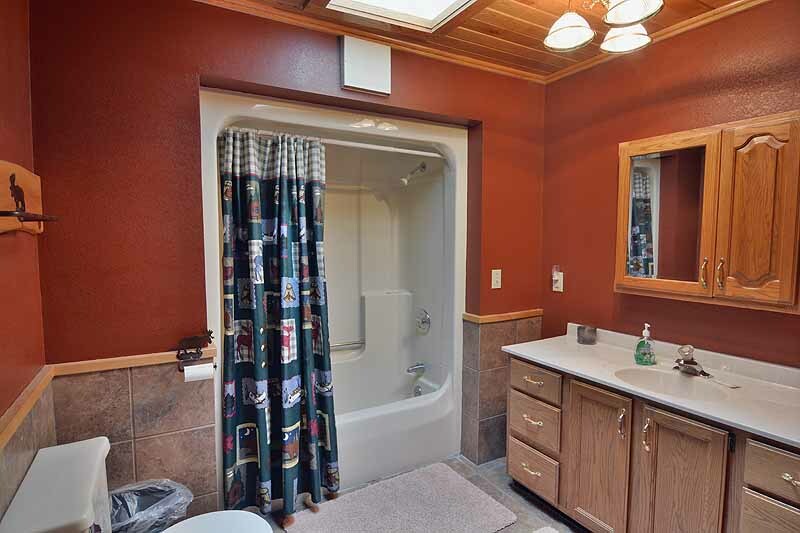 The large bath has a tub/shower and skylight. 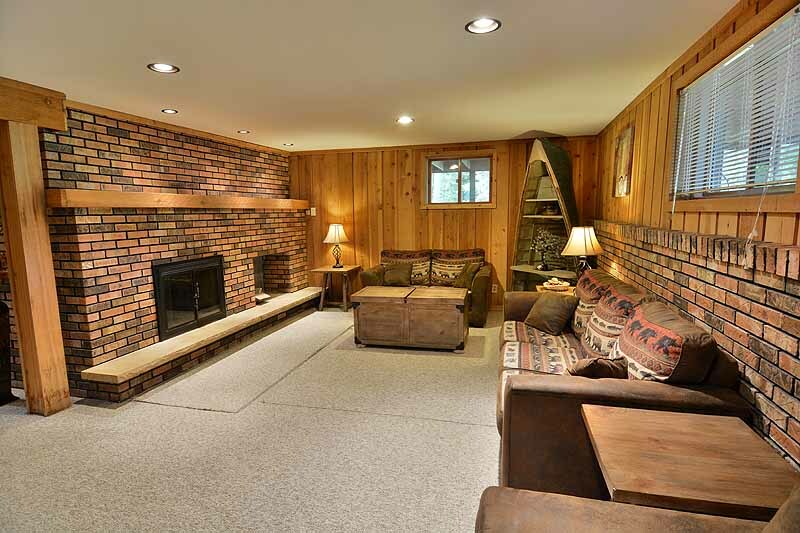 The lower level of the house has a second large carpeted living room with another massive fireplace. There are 2 stuffed couches, a chair and TV set with Cable TV and DVD player in the living room, too. 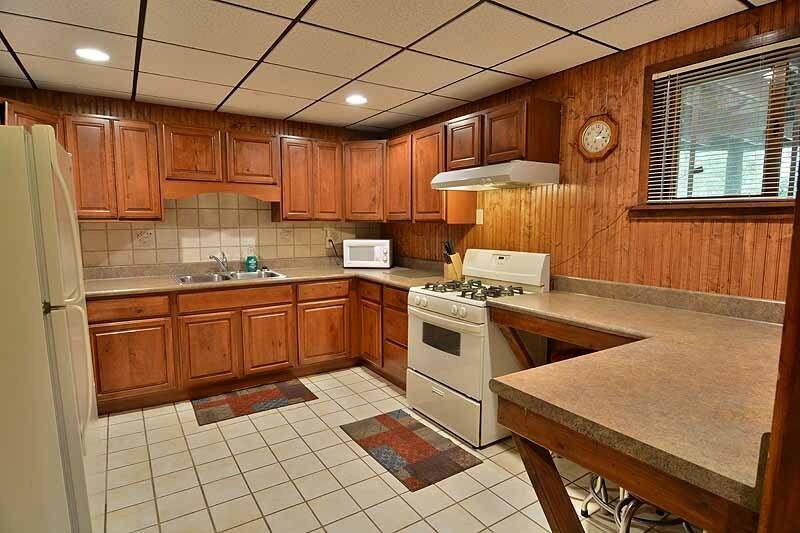 There is also another full kitchen with a 4 burner gas stove, oven, toaster, coffeemaker, microwave, and full size refrigerator/freezer. 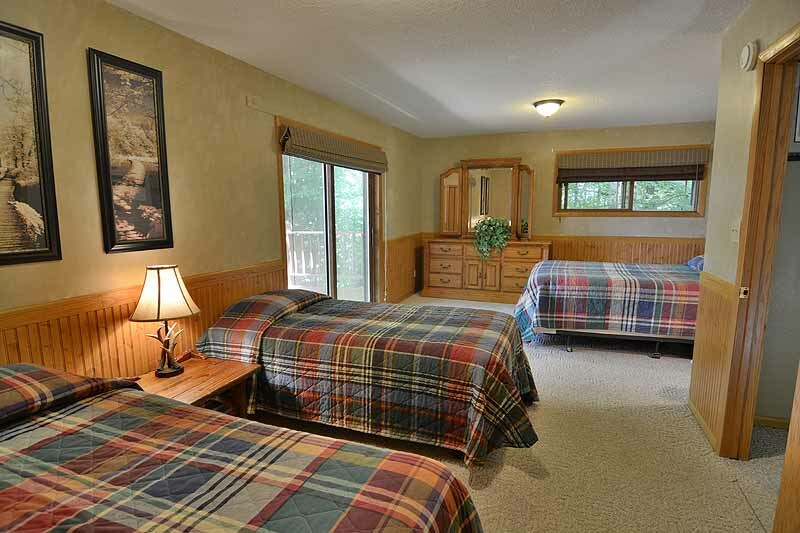 There are 3 carpeted bedrooms and another full bath in the lower level. All three of the bedrooms have 1 double and 1 twin bed. The full bath is finished in tile and wood trim and has a shower in it. 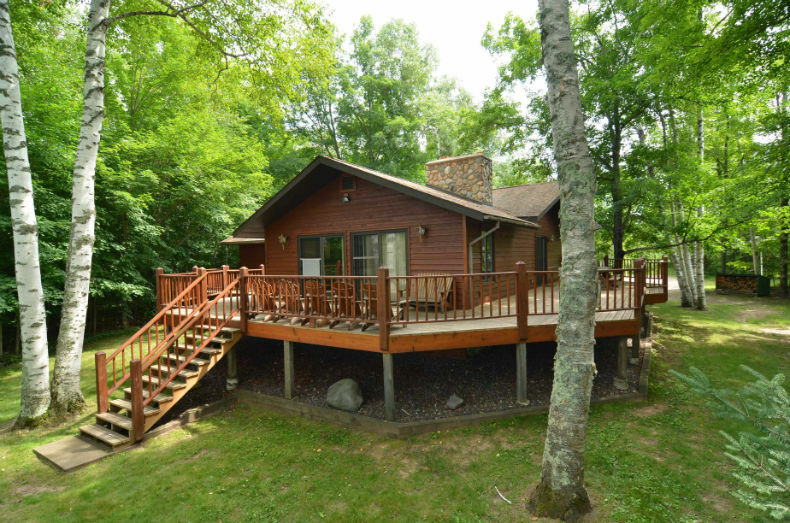 Split Level Home offers a spacious vacation retreat perfect for large families, reunions and small groups!